Pasta to me is ultimate comfort food. Tossed up in flavourful marinara sauce or just olive oil+ garlic+ mixed herbs, I can very happily devour a massive portion anytime. Beauty of pasta dishes is that you don't have to do too much to it. It gets ready almost in a flash and each time you are in for a treat! This recipe is also on the same lines. While pasta is boiling away, prepare balsamic cherry tomatoes and fresh basil pesto.Its as simple as that. If you have pesto ready with you, then it won't even take that long. Serve it cold or hot, either way it tastes delicious and one of my favourite ways to eat pasta. FYI- I think pasta and pesto are made for each other! I didn't even realize when I started relating with Italian flavours so much. May be because I love tomatoes and Italian food to an extent revolves around tomatoes. It also might be because of the heavenly aroma of Extra virgin olive oil + garlic together which captivates the entire kitchen. Or may be its the fresh intoxicating pungent flavour of basil which just transforms literally anything bland into something so gorgeous that I literally cannot stop eating it! These balsamic cherry tomatoes are bursting with flavour. They just explode in your mouth. So amazing! Balsamic vinegar does something magical to sweet cherry tomatoes. I have shared recipe of pesto before and mentioned a million times about how much I love pesto but somehow I have never shared a pasta recipe using pesto which I eat a lot. I have topped it with caramelized cherry tomatoes cooked down in balsamic vinegar. This dish really is simple but extra ordinary. Cold or hot, this classic Italian dish tastes heavenly. 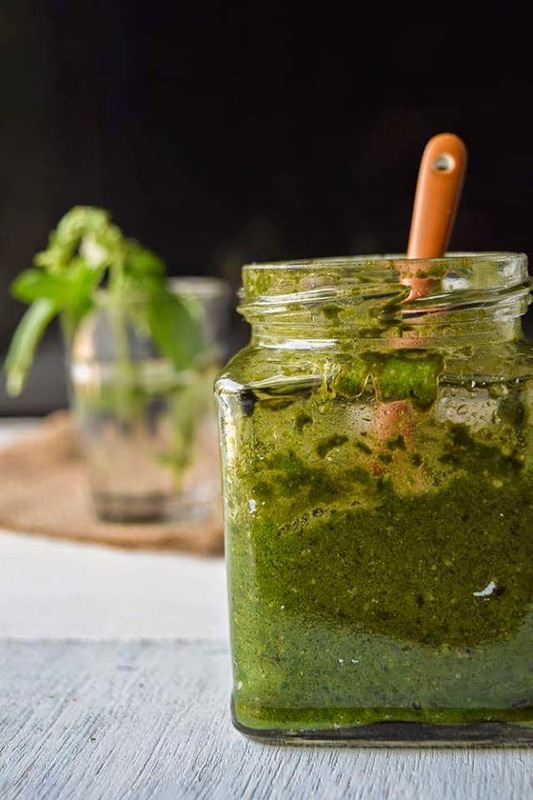 Perfect for busy weekday meals, all you need is a jar of home-made pesto in freezer. Add salt in a pot of water and bring to boil. Once water starts boiling, add pasta. Cut cherry tomatoes into two halves. Heat oil in a small pan and add tomatoes. Season with salt and pepper and add balsamic vinegar. Cook on high heat till tomatoes start blistering. Turn off the gas. Once pasta has reached al dente stage, remove from gas and strain all the water. Save about 1/4th cup water. (A trick I learnt from Nigella lawson). Serve pasta topped with more cherry tomatoes. This pasta tastes good when served hot but tastes even better cold. Follow on Instagarm, Pinterest, Twitter and Facebook to be updated on new recipes.